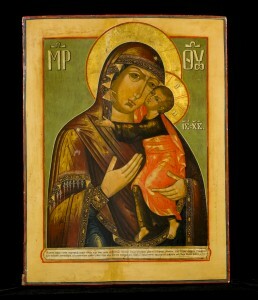 There is a forthcoming lecture to open up the windows into heaven even more, “Orthodox Christianity in Early Russia: the Formation of a Tradition” The lecture is presented by Paul Bushkovitch Ph.D.
Saturday, Feb. 8, 2014, @ 2 p.m. Orthodox Christianity has been Russia’s pre-eminent religion for more than a millennium and is integral to the nation’s history and culture. Yale University history professor Dr. Paul Bushkovitch will discuss the origin and foundation of Russian Orthodoxy, which has endured attacks and repression throughout the past, most notably during the preceding century. Dr. Bushkovitch earned degrees from Harvard and Columbia Universities and has studied in Russia. He has been a member of the Yale faculty since 1975 and has published and lectured extensively on Russian history. 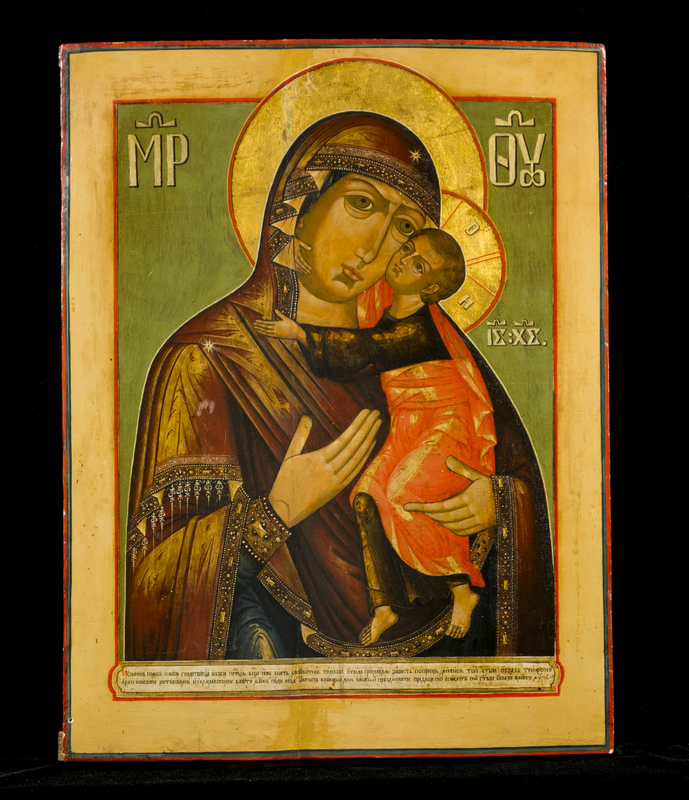 The Knights of Columbus Museum’s exhibition of Russian icons, Windows into Heaven, runs through April 27, 2014. The museum is open daily 10 a.m. to 5 p.m. 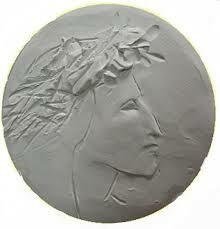 The first recipient of the Commedia Medal will be announced on 1 December 2014 and it will be award annually until 2021. The image of the award is posted here. It’s the creation of Dom Gregory Havill, a Benedictine monk of Portsmouth Abbey and a teacher in the Portsmouth Abbey School. Dante published the Inferno in 1314, the Purgatorio in 1315 and the Paradiso in 1321. Dante died in 1321. What a terrific way to acknowledge cultural icon by having a Benedictine monk create an artistic piece for an award of excellence and beauty! Benedictines have always had their fingers (and their hearts and minds) in matters of faith, reason,and art to communicate the Divine Mystery. Interested in the competition, visit the website here. Dr Sebastian Mahfood is organizing the competition. 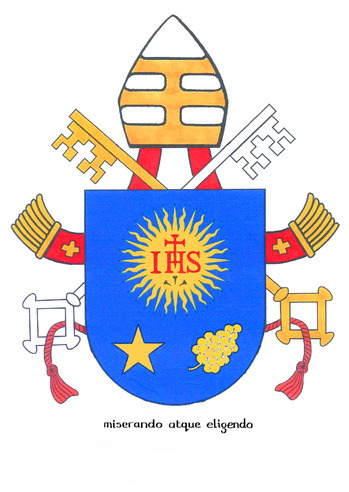 Pope Francis has decided to stick –more or less, with the heraldic art, that is, his coat of arms that he had when he was called to the Order of Bishop and then as a cardinal. The most identifiable change made is the replacing of the red cardinal’s galero and tassels with the papal keys and miter that Pope Benedict XVI chose for his arms in 2005 when he accepted the pontifical dignity but gone is the pallium. The other change is turning the star representing Mary, the Mother of God and the flower of nard representing Saint Joseph, to gold as opposed to silver. Add to the artscape is the image most associated to the Society of Jesus with the IHS sunburst. The Holy Family, hence, is illustrated here. The keys of Saint Peter refer to the gospel passage of Saint Matthew 16:16 where Jesus says to Peter, “I will give you the keys of the kingdom.” The keys represent the pastoral authority of Jesus given to Peter and thus to Peter’s successor to forgive sins, and lead us to salvation. The silver key concerns things of earth, and the gold key things of heaven joined together by the red cord symbolizing the common witness of the blood of the Savior shed for humanity. You may want to read the Catechism on the Petrine ministry at paragraphs 880-882, the whole section “I believe in the holy Catholic Church is worth” some study and prayer. 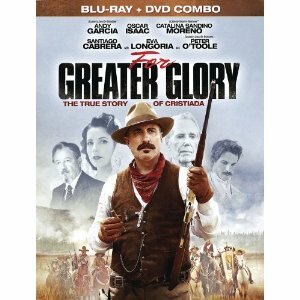 The movie, “For Greater Glory,” is now available on DVD on Amazon, but it is also available from Ignatius Press. daring people’s revolt that rocked 20th Century North America. This movie is an excellent addition for your Catholic library of film and appropriate for a high school Catholic curricula, the RCIA and adult faith formation work of your parish. This forgotten part of our North American history needs to be better known.